These are the voyages that require a bit more room than the regular trip, that require more passengers than the average saloon car. These are the times when you require a seven-seater luxury cruiser. And there are lots out there that easily fit the bill when it comes to mass transport, including several large people movers from home-grown and European manufactures. In most cases having a large amount of interior space normally counts against the exterior styling, as it’s difficult to make a large box on wheels appear anything other than boxy. The approach of the three cars that we have below is all quite different, and each of them manage to look very appealing depending on your tastes. It can be argued, however, that there isn’t a perfect car out there yet that can fit all seven people along with seven full golf bags. The existing options might be fine for a trip to the driving range, but on game days some people may end up walking. However, in all cases these seven-seaters offer fold flat rows of rear seats that, when down, offer extensive trunk space and could easily accommodate all equipment for you and three friends. Audi is a fairly recent entrant in to the seven-seater market, with the Q7 being on the road for just the last five years and having received only one facelift in that time. Audi has taken a more traditional approach that has more in common with an estate car with an extra row of seats than a boxy people carrier. 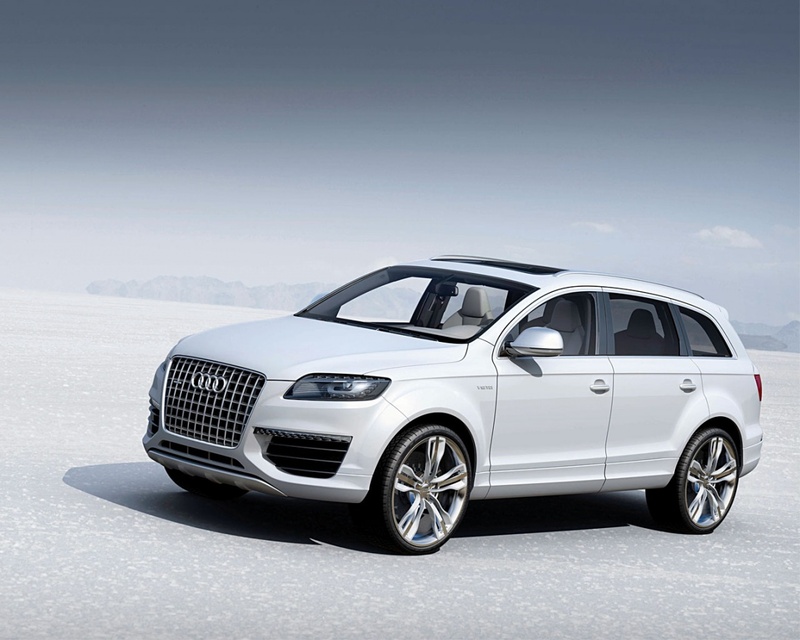 The Q7 sits somewhere between being a crossover from a saloon car to a full off-road vehicle. But as we have to keep in mind, this is an Audi, and the company’s fantas- tic German engineers have made its products quite sought after by motoring enthusiasts. A very strong motorsport heritage means Audi always produces very driver-focused cars that put the emphasis on performance. In the Q7, the company combines the driver experience with the option for six other people to enjoy the ride. The interior is finished to a very high standard with quality wood and leather materi- als all round, along with 1,000 watts of an advanced sound system from Bang & Olufsen. The only thing letting it down is that the rear three rows of seats can feel a little cramped at times. Being the heaviest of the bunch means that run- ning costs can be quite high. That said, in this car we have to focus on the drivability, as it consistently scores very high reviews for what is basically a 4x4 with saloon car handling. By far the largest in terms of interior space in of our selec- tion, the Nissan Elgrand has been around for generations. In its current guise, it takes styling cues from more traditional multi-person vehicles, which is evident from the sliding door to access the passenger compartment. Designed to provide the most comfortable surroundings for all passengers while appearing as sleek and stylish from the exterior, the Elgrand is boxier than its rivals in this test but still manages to ap- pear quite masculine and utilitarian. The car is also lighter than its competitors, which maximizes fuel efficiency and provides a more pleasing drive from its 3.5l V6 engine. Inte- rior specifications and features in this model are extensive, from the extremely comfortable captain seat options to the lie-flat seating options for the first row of rear seats. The cabin contains multiple screens for either DVD playback or the dash mounted screen, which accesses the many driving and parking assistance cameras throughout the vehicle. This may be a car that is more comfortable to ride in than to drive, but it still has something for everybody involved in the process. It is also built in the same factory that handcrafts the GTR, a very good stable, indeed. Another new entry to the game is the R350, which has been in production since 2005 but existed in various concepts for a number of years before that. It is another crossover vehicle that is closer to a soft-roader than a regular MPV, with its raised appearance and sleek stretched lines. Access to the rear is through the traditional car-like rear doors, which do provide plenty of access, although open at a much wider angle than is expected, which can cause problems in tight car parks. Inside, it’s everything that you would expect from a Mercedes, with a premium finish, and the panoramic sunroof really adds to the feeling of spaciousness once inside. Rear mounted LCD screens provide entertainment to the second row of passengers, and this can be piped across the main entertainment system for the rear three passengers too. As with every choice in life, it comes down to personal preference, depending on what boxes you are trying to tick. The Nissan is the most spacious and comfortable, the Audi handles the best and the Mercedes... is a Mercedes (with a green tint).